Reflecting its increasingly platform-agnostic stance, Microsoft on Thursday revealed plans to bring its Defender antivirus software to the Mac, if initially in limited form. Specifically Macs will get Windows Defender Advanced Threat Protection, renamed to Microsoft Defender Advanced Threat Protection (ATP), the company said. A limited preview is being offered to businesses that operate a mix of Mac and Windows PCs, consistent with ATP's business-only focus. The software requires macOS Sierra or later. 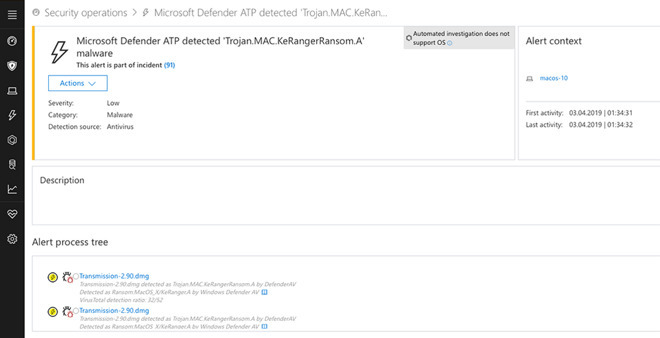 To update Defender, businesses will need Microsoft's custom AutoUpdate tool. It's not yet known if the standard version of Defender will come to Macs. To date that app has simply been integrated into Windows 10, ensuring a base level of security against viruses and other threats. Apple has had similar protections built into macOS/OS X since later versions of Snow Leopard, but these typically operate in the background. Since taking over as CEO in 2014, Satya Nadella has steered Microsoft in an Apple-friendly direction. Many Microsoft products have made the transition to Macs, iPhones, and iPads, more recently even parts of its Xbox gaming platform that should eventually let people play those games without an Xbox at all. If there was any form of anti virus I was less likely to install on my Mac than any of the current crop, it’s Microsoft anti virus. Why would any Mac owner want anything to do with anything in the way of firewall or antivirus that Microsoft built? Given the problems with Windoz and their updates that don't work crash computers I for one will be staying as far away as possible from any form of security Microsoft offers! I came to us a Mac because of Microsoft. I will never ever install a bit of their software again. I attribute all the grey and now white hair that I have to the years and years I spent fighting their stupidity at work. The day after I retired I nuked all my MS Software including VM's. It has gone and is never coming back. There is a reason why microsoft.com is blocked at my home firewall. It’ll sell like hotcakes. In the mind of the public Microsoft is a trusted brand. You’d be amazed at how many Mac users have anti-virus software installed. You see them all over the place in the Apple Discussion Forums asking which AV is the best. When troubleshooting in the forums tons of people have AV installed. With any bug, glitch, malfunction, etc. the typical user assumes right away it is caused by a “virus” without even knowing what a virus is. That’s the fact of life with the general public. So while Mac tech blog forums will be full of snickering and sarcasm the typical Mac user will probably jump on it. I don't think this is meant for you anyway. This version of Microsoft Defender is intended for mixed use commercial/institutional where a large number of computers are involved but perhaps on different OS platforms. This is not for the home user. Since Satya Nadella came and Balmer 'went' I have increasingly become less anti-Microsoft. I enjoy using Windows 10, initially in Boot Camp and now I have three PCs on my Network along with five Macs. I may be 'at home' but this certainly sounds something I will look at because I still fear the weakest link is Windows and it is on my LAN so it may be worth adding an extra layer. Windows Defender on my PCs in Windows 10 Pro is non-intrusive and seamless, it's not your old Windows. Don't get me wrong, if I don't need it I won't use it, I am just willing to investigate without prejudice, something I would not have said a few years ago. This isn't a sales pitch for Mac users, it's a sales pitch to corporate IT folks and the vast majority could not troubleshoot a Mac issue without hours of searching on forums. (What's a .kext?) Corporate IT folks want Macs to have virus protection. Those same folks are turning more and more to Windows/Microsoft's own built-in tools because they are much easier to manage in Windows 10. They force Office software on Macs, most still use Outlook as well. It's a natural extension. Apple is just the hardware provider and it happens to come with an OS that "works" with Microsoft products. It’ll sell like hotcakes. In the mind of the public Windows users Microsoft is a trusted brand. You see them all over the place in the Apple Discussion Forums asking which AV is the best. When troubleshooting in the forums tons of people have AV installed. Your conclusion is based on the common logical fallacy that the people who post on internet forums are representative of the overall population. However, the number of people posting on discussion forums is a microscopic percentage of the hundred million people that use a Mac. Even if there were 10,000 threads you could point to supporting your argument (there aren't even 100), that would still be less than .01% of all Mac users, and obviously it would be a subset of users who are experiencing problems. Or perhaps in a Parallels™ reality , well that is until you find out who is behind Parallels but that's another story. Ever since I first installed Windows 7, and now with Windows 10, I haven't kept any anti-virus except Defender installed full time, though I periodically install the latest version of MalwareBytes or Spybot S&D to scan (and then I uninstall them again). Zero viruses or malware discovered so far. It's not a question of being anti- or pro- Microsoft. Windows is an epically horrible operating system that has only grown more bloated with ads and other garbage since Nadella took over. Windows 10 is essentially Windows Vista with shiny new GUI layers, with nothing in the way of any tangible security and functionality improvements. Edge and IE are even worse. In fact, Edge is so bad that even though it is the default in Windows 10, it has a 1% market share barely. Things became so bleak for Edge that Microsoft decided to abandon their own web engine and turn Edge into a Chrome clone. Their customer service is virtually non-existent. I was recently locked out of my Office 365 account and it took days to get back in, after being bounced around half a dozen different departments. Their hardware, with the exception of Xbox and maybe Surface, is utter crap. The only product they offer that is ok is Office, which is light years ahead of Pages, Numbers, etc. Let's hope it doesn't suffer the same fate as Microsoft's other products. There are only two reasons why Microsoft still exists today. First, a massive installed base of workplace computers running legacy software prior to the rise of Mac in the early 2000s. And second, Office, another mainstay of the business world. Well, other than Kaspersky of course. Don't get me wrong I am a die hard Apple user since 1978! I hated Windows till recently and it has improved dramatically. That said I am not using these PCs for work they are all servers (OK I admit I had one tricked out to play GTA V in 4K lol, the rest are Dell Xeon Servers) running MySQL and I operate them 99% of the time from a Mac using Microsoft Desktop Remote so my interaction is limited to MySQL and the etc/host files for loopback, updates, port handling, and firewalls. All that is a breeze on Windows 10 Pro. All this anti-Microsoft rant is hilarious. Maybe learn how to use technology and you won’t have an issue with it. I’ve been using both Mac and PC since my early teens and never had an issue with either. Not sure what knowing “how to use technology” has to do with bloatware, ads, security problems, and poor customer service. In any case, I’ve been using Windows since 2.1 so I know a little about “how to use”it. The last decent version of Windows was XP, and every version since then has been an unmitigated disaster. I've never understood why ppl tolerated bloatware on a PC. Any PC I get in recent years I immediately wipe and reinstall a clean copy of Windows, never use any anti-virus from third parties (they are malware) and use Microsoft's own protection. I have never had any issues. That said from the likes of Dell directly they come free of crap, it's these cheap boxes that are filled with the crap. Amazingly - I see this as good news, and the other recent news of support for MS active directory. The more software available to MacOS, open or closed, the srronger the platform becomes. If you don’t want to use MS antivirus, then don’t - but this may give IT departments a better reason for buying Mac OS, and that has always been a struggle outside of buying for the creative department. If Microsoft killed off Office for Mac years ago (they were very close to it) I believe MacOS would have disappeared. You’ve probably never used Win 95 or 98 in a workplace setting. Because if you had, you would have experienced issues. If I am mistaken, then hats off, because you’d be one of the lucky few. As an apple users home and windows users at work for 20 years, after new MS CEO, Microsoft indeed amazed me now. My Windows 10 hardly have any issues. (it push out updates too often that require reboot, which bother me) . My latest MacOS actually have equal amount of issues if not more nowaday. I have to say I have equal respect on both OS now. I take a lot of notes which require me to copy and paste from various applications to OneNote, "copy and paste" work much better in Windows 10 than MacOS.